Our projects have covered a range of problems for both government and commercial clients. Here are a few examples. Our client, a Fortune-20 company, wanted to create a cost-saving service for its clients in the printing industry. We used mathematical modeling to meet their requirements. The service was designed to determine what fraction of a print job, such as an advertisement or product label for a mass-market consumer item, had subtle shadings of color. It would then decide whether to route the job automatically to an expensive printer that would be needed for the shading or to a less expensive one that would be adequate for anything else. 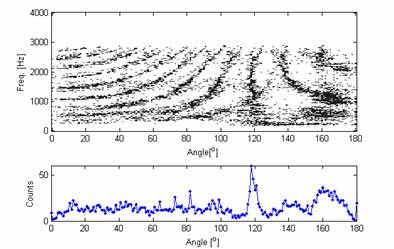 We defined and implemented the algorithms in MATLAB® application software, using fuzzy logic to model the eye’s perception and the brain’s judgment of well printed shading. The result over-performed the company’s expectations, even identifying important subtleties of shading that they had believed no algorithm could detect. 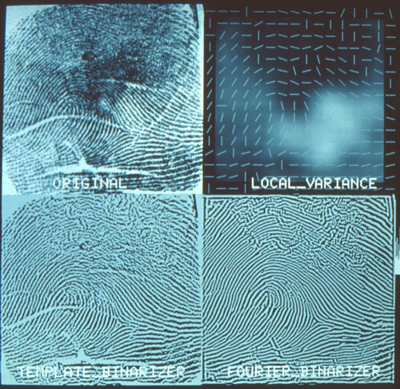 When fingerprints are classified, analysts use both the overall loop pattern of the skin’s ridges and “minutiae”, the specific locations where the ridges either split in two or end. With enough computing power, the minutiae alone can be very useful for automatically matching a scanned image of an individual’s fingerprint against a database of prints. This is the basis of AFIS, the FBI’s well known identification system. But there are problems, as a government customer explained: When the finger receives a cut, this produces a large number of new “endings”, minutiae that cannot match any previous print, and may not even match future ones if the cut heals without scarring. Creases do the same. This is especially true in heavy manual labor (such as housecleaning! ), which produces so many breaks that the sheer number of apparent minutiae might match practically anything. Also, if there are any stray marks on the image, stray materials on the finger, or fabric patterns underlying the print, these can falsely introduce or eliminate large numbers of minutiae. We noted, however, that all the new endings occur in matched pairs, and all of the other defects introduce patterns that do not resemble the strong patterns of fingerprint ridges. This allowed us to devise algorithms to remove the new endings from the images, “rejoining” the cut ridges and suppressing the defect patterns. The result is an image of the print in a more pristine form: with just the ridges of the finger, splitting or ending just where they originally did on the finger. No cuts, no marks, no materials, no fabric! a large crease on the left, just below the center, as well as other creases. Upper right: For each small section of the image, the processing identifies both the dominant local direction of ridge-like features, and the degree of contrast (variance, shown as brightness) between the ridges and valleys. Lower right: The second cleanup: Features that do not agree with the local direction (upper right image) — for example, creases, cuts, and even handwriting (not shown) — are now discarded. Most of the creases here are removed, with only faint ripples to show where they used to be. The focus of processing is on clarifying the overall structure: a loop in the case, with its center slightly below and to the left of the image’s center. However, the result also yields well determined minutiae, places where a ridge ends or splits, over a much larger part of the fingertip, with very few false “ends” where a crease separates each ridge into two pieces. The processing here occurs independently in each small region, so even a very partial fingerprint can be processed, and minutiae revealed. The result is an image that is far easier to process for automated classification and analysis. A company was interested in how a “listening” system can determine the directions of multiple sound sources from multiple microphones. We implemented an algorithm to detect coincidences of energy at many frequencies, between any pair of microphones. At any frequency, the peaks of a pure-tone sound wave at one microphone are coincident with peaks at the same time (or phase) in the other if the microphones are separated by any whole number K of wavelengths along the wave’s path. For any K, there is a corresponding direction of the sound wave. With many possibilities open for the correct K, there are many possibilities for the direction. This is what makes pure-tone sources so hard to localize with our ears. Frequency-analyzed coincidence pattern for two sources. Two sound recordings were played through small 1 meter (3′) apart and recorded for by two microphones 0.7 meter (2′) apart. (The samples have little energy above 3 kHz.) One source lay nearly in the “endfire” direction, near 180 degrees, the other at 63 degrees off the axis. The sum of coincidence detections (bottom) over all frequencies shows a clear, narrow peak near 117 degrees (180-63) and a broad peak near 165 degrees. The frequency analysis (top) shows a striking visual pattern for both detections across a range of frequencies and angles, enabling us first to construct a filter matched to this type of pattern and then to use it to detect the directions even more precisely. Most sound sources, however, produce time-varying energy at many frequencies. By watching for the few directions that are possibilities for many frequencies at once, and by building up the information over time, the system can begin to determine the directions of sources, even of multiple sources present at the same time. In practice, typical sources come in such a variety that the algorithm produces many false alarms until it has a very large amount of data. We therefore implemented a matched filter for the coincidence pattern that it produces, in order to suppress most of the false alarms while retaining the true detections. How can these answers be re-determined when the company changes the mixtures, as it does periodically? We knew that, in order to avoid “cooking” the compounds, the light source could not be intense enough to collect high-precision data in one second. Instead, a spectral scanner would need to use a limited number of wavelengths, or even broad spectral bands, provided they could sufficiently distinguish the spectra. This classic application of principal components analysis (PCA) allowed us to specify the optimal wavelengths for the designers of the light source. Moreover, the answer was based on the compounds themselves, and did not depend on how they would be mixed. For these wavelengths, and with the knowledge of the spectral technology and the time available for inspection, we knew the signal/noise ratio that the device could achieve, which told us immediately how detectable any contamination could be.